The black and white tile floors illuminated by rows of pendant lighting invite customers to the front, where they are greeted with a smile. A picture of Francis Quadrangle stretches from the floor to the ceiling, and pictures of Columbia adorn the walls. Since December 2007, McAlister’s Deli has been winning over the stomachs of Columbia residents. 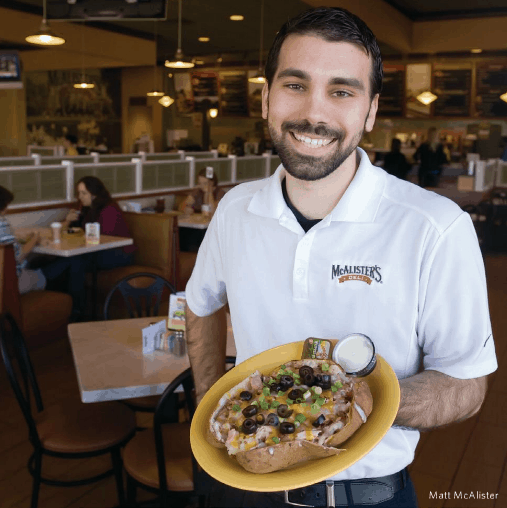 Though the franchise is based in Oxford, Miss., the flavors of the South have made their way to central Missouri, bringing a feeling of home to its customers at 1205 Grindstone Parkway. Sweet tea and giant spuds are among the menu choices that bring fame to McAlister’s. The Orange Cranberry Club, the Savannah Chopped Salad and Chicken Tortilla soup also satisfy customers daily. But just like any Columbia resident, McAlister’s knows a true community member gives back. The deli hosts fundraising events for organizations such as the Rock Bridge High School Jazz Band and Grace Bible Church. Supporting such events is not the only way McAlister’s blends into the Columbia community. The deli hosts entertaining competitions such as Tuesday Trivia and Catch the Catering Van, awarding winners with free cookies and VIP cards for free meals. While community involvement is important to McAlister’s, the goal of the deli is still the comfort of its customers. Check out the menu, the latest contests, fundraisers and gift cards atwww.mcalistersdeli.com.